I was struggling to write today’s blog. Not only because it involves the fact that our wonderful dog, Klunkers, diagnosed with degenerative myelopathy, needs this project, but that Matt and I basically rigged/”winged” it. Don’t get me wrong – we certainly applied our DIY know-how…it’s just that we had no instructions and had to somewhat feel our way through the dark on this one. Still, I think we did okay! Admittedly, it was pretty fun to deconstruct a pallet (used to transport our new washer and dryer), for most of our materials. So…I’ll do my best, but, will mostly show you how we built this doggie ramp by way of a photo tutorial. Klunkers, you can now come out from behind that tree. 1. Start by deconstructing your pallet. Use a hammer and pry bar, along with a bit of patience and finesse! Start by deconstructing your pallet. 2. Measure the width and length of your stairs. Then, use pressed wood (it’s much cheaper!) for the ramp. Measure the width and length of your stairs, then use pressed wood (it’s cheap) for the ramp. 3. Cut your pallet pieces to fit the width of your ramp. Cut your pallet pieces to fit the width of your ramp. 4. Screw in your support pieces. Here’s the “rigging” and “wing’n it” portion of the how-to. You’ll just need to add pallet pieces where they can fit and add strength to your ramp. Screw in pallet pieces to add strength to your ramp. Place your pallet pieces any which way to add strength to your ramp. 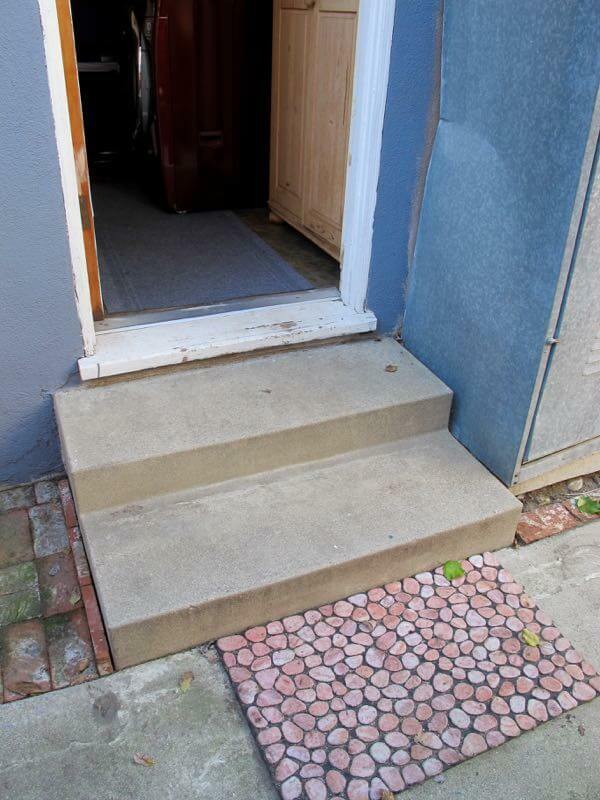 As you work down your steps, you’ll need to add more pallet pieces under your ramp. Screw in side pieces to keep under pieces secure. Screw in more pieces to fit the angle of your ramp – this is at the bottom step. 5. Staple your artificial turf onto the top of your ramp. This helps to prevent doggie paw slipping. Staple your artificial turf to the topside of the ramp. 6. Nail in your moulding pieces for the low profile ramp steps. Add moulding for low-profile steps. 7. Stick on the no-slip tape strips onto the moulding. Tape on the no-slip strips onto the moulding. 8. Attach the L brackets for the side panels. Attach the L brackets for the side panels. 9. Screw on the side panels. Screw on the side panels. Side panels prevent Klunkers from walking off the side. If you have any ways to improve this ramp…do tell!